First I would like to extend a HUGE thanks to all of you who have voted for my submission in the Ivory Homes design contest. Voting ends tonight at midnight MST, so please take a minute to visit Ivory Homes Facebook Page, "like" Ivory Homes, and then "like" my picture. I so appreciate the support! Now, onto today's tutorial. Remember these fabulous curtains I revamped for my Master Bedroom Makeover? I also had originally hung a curtain rod that barely covered the window. The rod didn't extend past the window on either side, so even when the curtains were completely open they still covered part of my window. Big woops. Because we use our curtains for a purpose and not just for decor, I needed to have a full rod (in lieu of mini rods on each side, which is a fantastic way to create an expensive look for less $). By extending the rod on both sides, I would be able to push my curtains away from the window (barely covering it) to create the illusion of a much wider window. I also wanted to bring in a pattern that wasn't too feminine, and something more modern to balance out the vintage and feminine touches. I considered using the leftover black and cream damask fabric that I used for our French Wingback Chair but decided it would be too harsh of a contrast against the white, particularly in a bedroom with such a neutral pallet. Once I decided on this fantastic print by Waverly, Cross Section in charcoal, I went to work. This fabric was super difficult for me to find, and ended up buying the last 7/8 yard in Utah.... no joke. 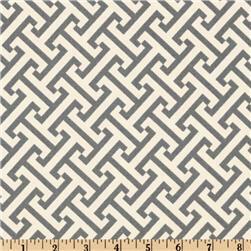 I have found it for the lowest price online HERE at fabric.com for about $9/ yard, but it is rarely in stock. Joann fabrics carries the exact same print (by PKauffman) for a much higher price of $25/yard and can be purchased HERE. Never pay full price for fabric through Joann. 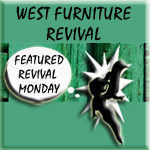 Their home decor fabrics are almost always on sale for 50% off, or you can use their 40% off coupon. First, I ironed my existing curtains and new fabric well. Second, I cut my existing curtains 6" down from the seam below the grommets (this can be whatever number you choose- I decided to do it low enough that I still had a significant amount of white at top and so that that I didn't have to sew in new grommets or loops). Third, I cut my fabric being inserted to size. My existing curtains were approx 82" long by 50" wide. My new rod would be hung approximately 94" high on my wall. I would need an additional 14" for each panel, plus approx. 2 inches seam allowance for the height, and 4 inch seam allowance for the width (since I would have to fold it over twice with a 1" fold to match the fold of the existing curtains). So I cut each piece to be 16" high by 54" wide. Fourth, I stitched my hem on each side. To match my white curtains, I folded the fabric inside 1" and ironed it well in place. I folded it over again and ironed it well. Once I had a perfect 1" fold, I stitched it in place to match the hem of my white curtains. Next, I lined up my new fabric with the top portion of my white curtains, right sides facing each other. I stitched a straight line at 5/8", using a back stitch on each side. I repeated the same process with the bottom portion of the white curtain. The last (optional) step which I have yet to do (but promise I will) is to serge the back side edges that you just stitched previously. Serging is very permanent so I wouldn't recommend this step until your seams are perfect and where you want them. There you have it, longer curtains with more character! Here's how I made a longer curtain rod to match my existing finials for super inexpensive! It was the perfect width, 10' long (plenty of length for what I wanted) and best of all, it cost $1.98. SOLD! I already had the rod hooks from my existing curtain rod, but you can purchase them in packs of 2 at Home Depot for about $3 a set. For this long of a rod , I would recommend using 3 rod holders. Once I managed to get my 10' long rod home (I wouldn't recommend trying this with a toddler in stow and a very small car- trust me)﻿, I measured my window and marked the desired width of my rod with a sharpie. My window is approx 60" wide, so I added 22" additional on each side, making my desired rod 104". I sprayed the rod with several very light coats of Rustoleum hammered dark bronze spray paint, while leaning against the wall so that the rod wasn't on the floor and wouldn't stick to the floor, creating a sticky mess on the bottom of the rod. If you do your coats too thick, or spray too close, the paint will run and create drips, particularly on metal. I sprayed right up to the line I had marked. Once the paint had dried completely, I cut the rod to size using a hand saw while holding the rod in place with clamps. Lastly, I hung my curtain rod holders where I wanted them (one on each end and one in the center for support) and screwed in my finials on each end. Note- I still need to spray my rod holders to match the rod... coming soon! If you don't have finials from an existing rod, I found some fabulous ones sold separately (without the rod) on clearance for $1 each at Home Fabrics. Viola! Sit back and enjoy your ever so inexpensive and glamorous curtains and rod. Thanks for stopping by! Please remember to vote! Wow! What a great transformation! I'm your newest follower and I've been enjoying looking around your blog. I did something similar for a curtain rod . Since I could only find 3 rods and needed four, I used a broom stick and spray painted it. You've done a great job with your room and all your diy's look fantastic! Great, great, great job! The lamps might be my favorite part. Your room is gorgeous. Thanks for your kind words on my blog! Your room looks great! I am very impressed at your thrifty-ness and eye for design. Joy, so glad to have you here! A broom stick? That is fantastic!!! I love anything out of the ordinary and inexpensive. Thanks for sharing. Thanks Samantha! I knew the lamps had something fabulous to offer when I saw them at Wallyworld. I just had to look past the fact that they were called "pineapple" lamps. Fortunately my shades cover the top... :) Thanks for stopping by! Please visit again soon. Jen,you figured it out! So glad you are following! Okay so not only do I know Stacy, she is my sister in law! How do you know stacy? this is great- i need to extend mine. i'll have to look into this-thanks for the tip! They turned out beautiful. Thank you for sharing. I'm your newest follower. I would love it if you linked your project up to my link party. Just love the master bedroom - just realized that I commented on your nightstand project as well as your fantastic new chair, I must follow you now - as I am really loving your projects! Will definitely keep this in mind when doing my daughter's curtains. I have almost same curtains, white with grommets. Maybe I'll add a pink stripe to coordinate with her room. I'm also a new follower. Thanks andrea! I would love to see your daughter's curtains when you are finished with them. So excited to welcome you as our newest follower! With style, huh? Well, my half-sister has been having a problem with extending her curtain, I bet she'll love it once I show this to her. And judging the by the looks of it, the result is great. I am just curious as to how you screwed the finials on the plain metal tubing? I LOVE the nightstands so much!! And you did a great job on the whole room! I found your blog via Google (though I did see your table on AT and bookmarked it--I, too, have a dining table that needs some love!) while looking for a tutorial to lengthen a shower curtain. This post was exactly what I needed. Thanks! The room is so beautiful...I am very impressed with the curtain...look so beautiful. Super tutorial - just what I've been looking for as I need 102+ inch curtains and all my favs are 84". THANK YOU!!!! Great post! Just googled "how to lengthen curtain panels" and came across your blog! Just what I needed! I cranked out a beautiful new curtain in no time!! Thanks for sharing!